When I think of pink, Barbie always comes to mind. Or is it pink macaroons? It was every girl's favorite color growing up except for the odd child that I like to consider myself. Growing up in a family of all boys, Lego's, cars, and sports occupied my time more than Barbies. Nonetheless, I did love a good dress up with grandma's clothes. I was very hesitant and instantly gravitated towards the olive shades this past month but this double-breasted vest completely changed my feelings around. Fashion is definitely having an affection with pink and I think I am too. Since I have light hair and a lighter skin tone, I opted for a pink with a kick. Although pale pink is beautiful, since I styled it with a skirt, I wanted a pink shade that would really amp it up. Add a red lip and pink is all of a sudden a fashion statement and not such a "pretty" color anymore. Last but not least, a group of fabulous bloggers and yours truly have teamed up to bring you another fabulous giveaway. We're so grateful for all your support! We're rewarding one precious follower with a grand package worth $1,500! The package includes a Canon Rebel camera body, 2 lenses, strap, camera bag, tutorial DVD, and other camera accessories. PLUS a Kate Spade handbag and wallet with chain. Open to international contestants but international winner will be responsible for shipping and applicable custom fees to be paid prior to shipping. Contest ends on September 06, 2015. I think that you've done a great job styling this outfit! 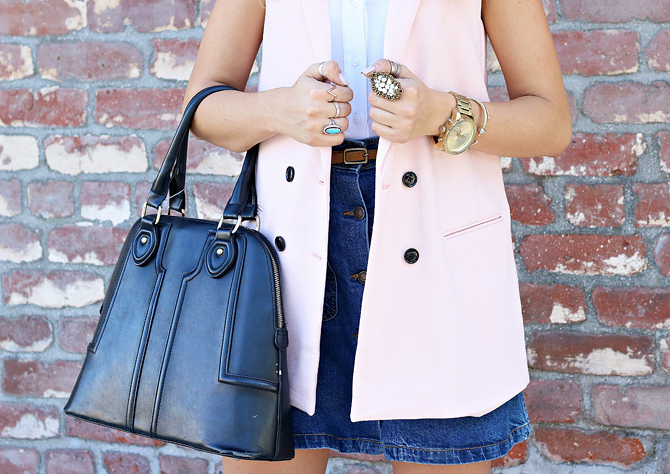 Your vest and bag are perfect pieces!